The beautiful lobby at the JW Marriott has two “bars” but only one serves alcohol; the other is a full-service, made-to-order sushi bar. GFWC has contracted a $1 per night resort fee with the JW Marriott. If your reservation or final bill shows anything other than $1 per day, please contact GFWC staff. The GFWC App is a great tool for clubwomen all year. It is especially useful during Convention for viewing the agenda, posting pictures, and receiving alerts in the event of a schedule adjustment. While Palm Springs may be the most famous city in the Coachella Valley, neighboring communities include Palm Desert (actual city of our hotel), La Quinta, Rancho Mirage, Indian Wells, Desert Hot Springs, Indio, and Cathedral City are worth a visit too. If you’re in need of a quick bite for breakfast, check out the breakfast Grab and Go (hours based on demand) for GFWC attendees starting Friday, June 23. The spa at the JW Marriott features 48 treatment rooms, an outdoor salt-water pool (included in Spa Treatment price), bistro, and salon. A table seating software program is used to randomly assign seats at many meal functions. If seating is assigned, your meal ticket will have a table number. If you have reserved seating for a meal or business session, please refer to the protocol sheet in your registration packet. You will enjoy seeing and hearing some fine-feathered friends during your stay, including several Chilean Flamingos, exotic birds in the lobby, and elegant black and white swans on the lake. GFWC Marketplace will be highlighting new items such as Convention T-Shirts, pashmina scarves, sunglasses, earrings, and a necklace charm. Like miniature golf but long for something more? Try the complimentary adult putting greens right outside the lobby. Ask the concierge for a golf ball and putter…and scorecard if you’re the competitive type. In a slight departure from recent Conventions, state/group photos will be taken on two evenings—EC States and WSR States on Friday and the remaining states scheduled on Saturday. Remember to wear comfortable clothing and flat shoes on the “Soaring Heights and Celebrity Sites” Tour. Temperatures at the summit can be 30 degrees cooler than on the ground…which may make the mountaintop the most pleasant place to be outside in late June. Exhibitors will be open from Friday afternoon through Monday evening. Partners will be in the foyer nearest the meal ballroom and vendors will be in the foyer closest to the business session ballroom. When you stop to browse or chat, let them know we appreciate their continued support of Convention. To follow along with Resolutions and Bylaws discussions, we advise bringing the Call to Convention found in the March/April issue of Clubwoman Magazine. If you do not subscribe to Clubwoman Magazine, you should…it’s great! Speaking of subscribing, GFWC will once again give cash awards for increased subscriptions to Clubwoman Magazine and the Legislative Action Center. Encourage everyone in your club to sign up! Sunday, June 25, will be an on-your-own evening. The hotel has plenty of delicious options for those wanting to stay onsite. This night is also a perfect opportunity to meet with your state or national club. Stay hydrated! Hydration is the best way to prevent jetlag (continuously sipping water is better than chugging). With the desert climate and all the activities at Convention, it’s easy to over-do it. Slow down and enjoy your time among friends and the amazing scenery in this oasis. 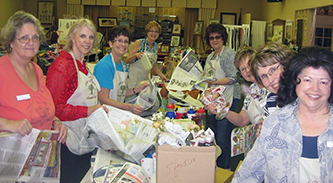 A club member since 1985, GFWC Treasurer Wendy Carriker is a proven leader in her community and state, and a dedicated clubwoman.